"A marinade guaranteed to make your chicken breasts tender and juicy! This one has a little bit of everything in just the right proportions." In a large glass bowl, stir together the vinegar, oil, soy sauce, lime juice, lemon juice, sherry, mustard, and honey. Mix in the garlic, brown sugar, lemon pepper, oregano, rosemary, and salt. Place the chicken in the mixture. Cover, and marinate in the refrigerator 8 hours or overnight. Preheat the grill for high heat. Lightly oil the grill grate. Discard marinade, and place chicken on the grill. Cook 6 to 8 minutes per side, until juices run clear. 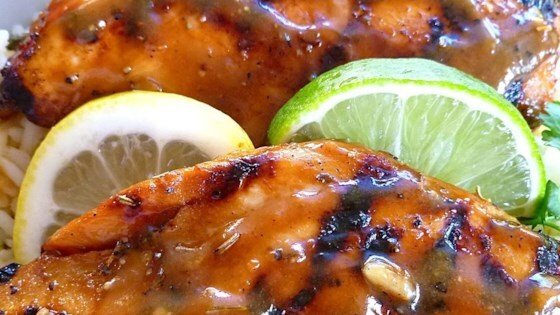 This citrus marinade makes chicken moist and tender on the grill. The nutrition data for this recipe includes information for the full amount of the marinade ingredients. Depending on marinating time, ingredients, cooking method, etc., the actual amount of the marinade consumed will vary. We weren't real crazy about this chicken; we could taste the vinegar and soy sauce fairly strongly. Thanks for sharing your recipe, Ray.